Sir I use Internet Explorer browser to surf the Net. Unfortunately, something just corrupted my Internet Explorer browser. Now I am unable to use it. I do not understand what went wrong. I had not downloaded anything .Should I reinstall the browser and if yes how to do it. Fix for the Error: "HKEY_LOCAL_MACHINE/System Corrupted." on Windows 7 System? Re: Internet Explorer got corrupted. How to fix this? 3.Then click the "Advanced" tab in the window that appears. 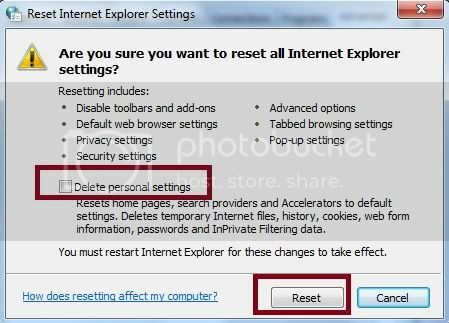 4.Then Click on the "Reset" button under "Reset Internet Explorer Settings." 5.After that read the warning. Click "Reset" in the confirmation window. Then internet explorer will open. 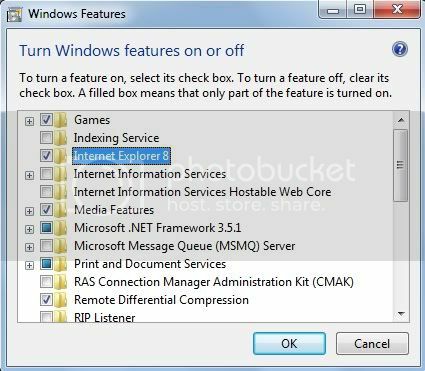 => Click on "Turn windows feature on or off"
If you can't use internet explorer then it is recommended to uninstall it & to install a new & upgraded internet explorer. But if you can open the internet explorer, you can reset the settings & try once before uninstalling it. Select Internet option from the drop down menu. 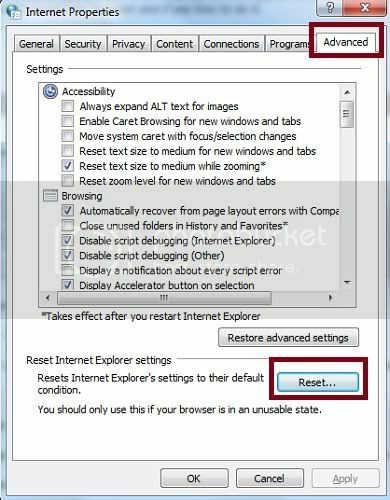 In the newly appeared dialog box, select the advanced tab & Click on the Reset option under Reset Internet Explorer settings. Click on Apply+OK to save changes. Restart internet explorer & now try to access the web. If it doesn't work then you have to definitely uninstall the program. You can uninstall it from control panel Uninstall a program option. Type Run in the search box & click on the option appeared to open the Run window. Type %windir%\ie7\spuninst\spuninst.exe in the edit field & hit enter. Now follow the instruction of the new appeared wizard to remove the program. Hope these info will assist you to solve your problem. Though there are a number of options available to try to retrieve and reactivate damaged files but there is not guarantee that they will be able to help Internet Explorer reborn. As the proximity of damage may go beyond repair. So better try a reinstall which is not time consuming too. A reinstallation of the Windows in your computer will reinstall Internet Explorer for sure. You can go to the website Microsoft .com and download a fresh copy of I.E from there, which you will be needed to install to your PC. After clicking Download button, download will begin and once finished click install and will then automatically installed to the directory, and once finished you can use it for further use. You might have to reinstall you internet explorer. 2. Goto Add or Remove Programs. 3. Select Internet Explorer and unistall it. again problem arises then some files may be corrupted for this you have to re install the internet explorer. 7. then ....finally click on the FINISH button....then the restore process will start....after the completion of restore reboot your pc. Your internet explore got corrupted time to time, solve to this problem Now you restore the internet explore..
first you remove the internet explore form the computer then you restore the internet explore..
click the Add or Remove Program and click the Add/Remove windows component..
it automatic restore the internet explore, automatic take the Windows CD and restore then you working with out any problem..
How to fix Windows OS if its got corrupted with some files?